The Krishna Valley region has a rich heritage of Buddhist art befitting one of the greatest centres of Buddhism. SCULPTURAL PANEL, PANIGIRI, c. 1st century A.D. (Andhra Pradesh State Museum, Hyderabad). The upper part of the panel shows the Buddha's headdress being carried up to the Tushita heaven. The lively and supple depictions of the figures are remarkable. THE valley of River Krishna, in present-day Andhra Pradesh, was a fertile land, which, from ancient times, saw the blossoming of art infused with the life of the spirit. Here, the bounty of cotton textiles attracted Romans and others from afar, and there developed a prosperous, cosmopolitan culture. As everywhere in India then, philosophic thoughts preoccupied people. The search was for that which was beyond the material aims in life, and all permanent structures, art and monuments were dedicated to this eternal quest of the people. 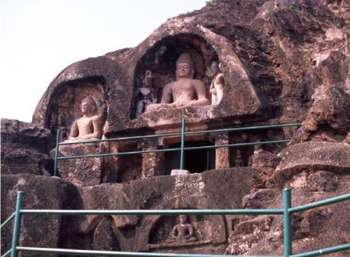 This region of the Deccan has a very rich heritage of Buddhist art and architecture. An early cave at Guntupalli has a facade that is directly reminiscent of the Lomas Rishi caves at Barabar (in Bihar). These were made in the 3rd century B.C. by Emperor Asoka and his grandson Dasratha for the Ajivika sect of ascetics. 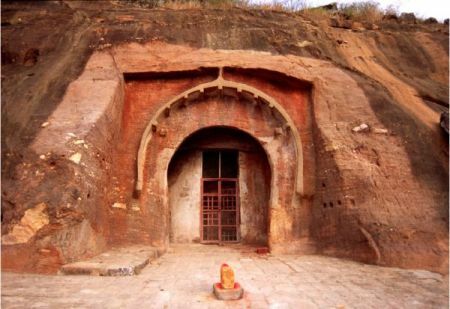 The Barabar caves are known to be the earliest in India and perhaps the inspiration for the rock-cut architecture of the Deccan. CHAITYA, SALIHUNDAM. THERE are many Buddhist stupas and a vast monastic complex on a hillock near the banks of the Vamsadhara river in Srikakulam district. The site was found in 1990. Excavations revealed stupas, a chaitya-griha, temples and sculptures of three phases of Buddhism - the Theravada, Mahayana and Vajrayana - dating from the 2nd century B.C. to the 12th century A.D. The exquisite later reliefs of the Krishna Valley are similar in many ways to the art of the Ajanta paintings in the western Deccan. The reliefs exhibit a supple grace, and the lines and expressions convey a quality of introspection: a preoccupation with that which is beyond the worldly realm. In the first two centuries A.D., great caves were hewn out of the mountains in the western Deccan. Enlightenment, the Great Truth beyond the world of forms, was the focus of meditation. The creative forces and the joy of life were represented in the form of divine Yakshas and Yakshis. They were filled with a sense of well-being and the fullness of life. Joyous Devotees, Panigiri, 1st century A.D. Recent excavations carried out by the Department of Archaeology & Museums, Andhra Pradesh, have unearthed well-preserved exquisite reliefs on stupa railings and pillars of the 1st century A.D. There is a sophisticated sense of design and the figures are full of activity. They convey the joy and flourishing culture of the Krishna Valley in that period. 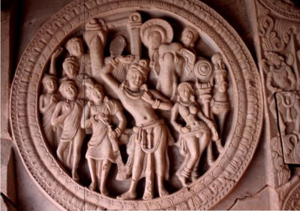 Meanwhile, in central India, by the 1st century A.D., the toranas of the gateways of Sanchi were complete. The Enlightenment of the Buddha and the path of dharma were represented by symbols that were universal to all religious streams in India. Yakshas, Yakshis and Lakshmi were presented in the art. On the plains of the Ganga and in Gandhara, in the first two centuries A.D., images of the Buddha, Jaina tirthankaras and Hindu deities had come into being. The fertile valley of the Krishna river was the cradle of civilisation in the eastern Deccan. This area became one of the greatest centres of Buddhism, and over 140 early Buddhist sites have been listed in the region. A SCULPTED MEDALLION from Panigiri. Recent excavations, conducted by the Department of Archaeology & Museums, Andhra Pradesh, have unearthed a rich treasure trove of fine sculptural reliefs made on stupa railings at Panigiri, about 110 km from Hyderabad. These date back to about the 1st century A.D. The stone is marvellously carved to convey the softness and pliability of human flesh. 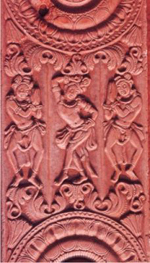 Stylistic similarities with the art of Bharhut suggest that the early reliefs found here at stupa sites belong to the 1st century B.C. Jaggayapeta, on a tributary of the Krishna , had many stupas. A relief from Jaggayapeta shows a chakravartin, or a universal monarch, and his seven precious possessions. 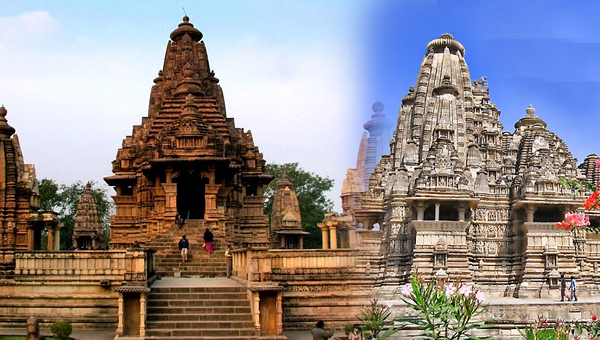 The shallow carving and other stylistic features are similar to Sunga period reliefs at Sanchi, Bodh Gaya and Bharhut. The Buddhist site of Amaravati is on the banks of the Krishna, next to the ancient capital of Dharanikota in present-day Andhra Pradesh. The history of the stupas at this site covers at least 1,400 years, from the time of Emperor Asoka in the 3rd century B.C. The earliest railing pillars of the stupa are of granite and were installed by Asoka. By the 1st century B.C., the stupa was enlarged and sculpted limestone slabs with narrative sculptures were added. 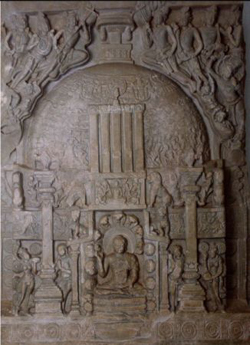 A drum slab of the stupa shows the Buddha’s enlightenment under the Bodhi tree. Footsteps and parasols indicate his presence. The shallow relief, broad faces, turbans and heavy earrings are reminiscent of other Sunga period art. In the 2nd century A.D., the Satavahanas extended their rule to the eastern Deccan. Under them, the sculptural relief of the magnificent stupa reached its culminating phase. The entire stupa was covered with shimmering limestone slabs, with exquisite sculpture. An ornate stone vedika was also added. Today, only a mound remains of the Mahastupa, or Great Stupa, as it is called in inscriptions. In its time, its glory was known throughout the Buddhist world. Sculptures, Panigiri, 1st century A.D. The graceful compositions of the Krishna Valley reliefs are among the finest in Indic art. The flow of lines is mellifluous and conveys the quality of grace that underlies all of creation. These railings and pillar fragments were excavated recently by the Department of Archaeology & Museums, Andhra Pradesh. Fortunately, we have an idea of what the stupa looked like from depictions of it in the sculptural reliefs. This self-imaging of the monument is a tradition that continues from here onwards in Indian architecture. The Mahastupa was 162 feet (49.4 metres) in diameter. The railings were made 15 feet (4.6 m) away, taking the total diameter of the monument to 192 feet (58.5 m). The railings were richly sculpted. Their pillars, about 10 feet (3.05 m) high, had full-blown lotuses in the centre and half lotuses on the top and the bottom. The lotus, which rises in its beauty from murky waters, is a pan-Indian symbol of purity and transcendence. Narrative carvings of the life of the Buddha were made on the inner surfaces of the pillars. The stories are told in greater detail here than was done earlier at Sanchi. 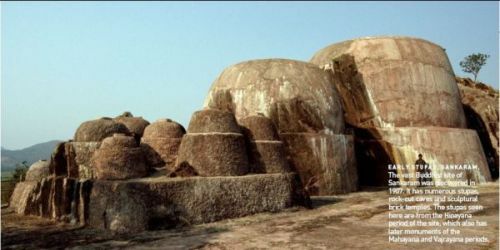 Early stupas, Sankaram. 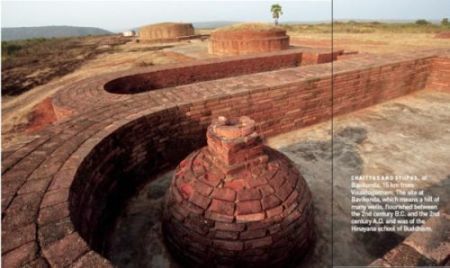 The vast Buddhist site of Sankaram was discovered in 1907. It has numerous stupas, rock-cut caves and sculptural brick temples. The stupas seen here are from the Hinayana period of the site, which also has later monuments of the Mahayana and Vajrayana periods. From the 1st century A.D. onwards, artists in North India, around Mathura and in the northwestern Gandhara region, had begun to depict deities in human form. Earlier, symbols had been used to indicate the presence of Buddhas and Jaina tirthankaras. Artists in the western and in the eastern Deccan took more time to break away from earlier conventions of art in which personalities had not been depicted. It is only in the 2nd century A.D. that the Buddha was depicted in the art of the Deccan. 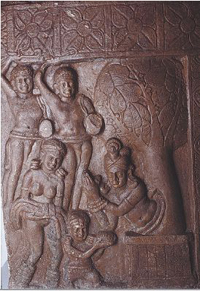 A pillar of the vedika depicts the Buddha receiving rice pudding as his first meal after abandoning his austerities. Below, we see the enlightenment of the Buddha, beneath the Bodhi tree. 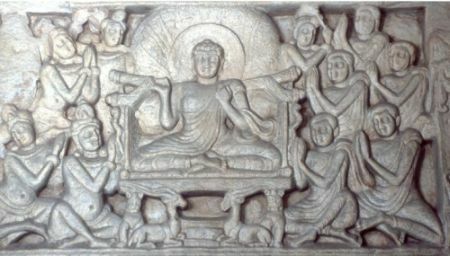 In this sequence, the Buddha is indicated by his footprints. Another pillar narrative depicts the Great Departure, when Prince Siddhartha rides out of his palace to renounce his worldly life. Below, the story ends with the First Sermon of the Buddha, at Sarnath. After the Enlightenment, the artist preferred to use the symbol of the chakra instead of the human form of the Buddha. The coping of the railing is fully adorned with eternal themes. Often a thick and luxuriant garland is depicted. It is reminiscent of the vine of the fullness and bounty of nature that was seen in the 2nd century B.C. at Bharhut and later at Sanchi. It is carried by turbaned youth, who represent the urbane city-dwellers of the prosperous Krishna Valley. Standing Buddha, 3rd century A.D. (Archaeological Survey of India site museum, Amaravati). The Buddha figures of the Krishna Valley, with their serene expressions and dignified monumentality, were models for the Buddhas made in many Southeast Asian countries. On entering the hallowed enclosure, to circumambulate the Great Stupa, the worshipper saw exquisite carvings on either side. On the right, the drum of the sacred stupa had slabs that were about 6 feet (1.8 m) high. Sculpted dome slabs rose another 11-and-a-half feet (3.5m) above the drum. A world of Buddhist narratives was created, through which the worshipper moved as he went around the stupa. Sculpted scenes, such as the Birth of the Buddha, would transport the viewer far from everyday concerns. His soul would be lifted in response to the beauty and grace before him. In the rapt attention and divine contemplation on the faces of the attendant figures, the artists appear to have portrayed the devotion within themselves. It is a realm of gentleness and beauty, which awakens the best within us. Chitrasutra, the ancient treatise on art making, states that the purpose of art is to transform us through the presentation of harmony and grace, to show us a glimpse of the Eternal, which underlies all of creation. Scenes from the Buddha's life, Panigiri (Andhra Pradesh State Museum). 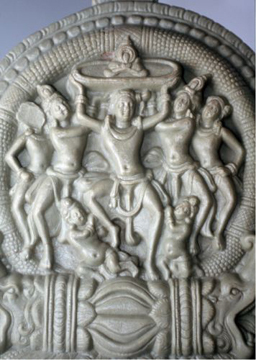 The reliefs of the 2nd century A.D. at Amaravati are deeply cut, which gives them the appearance of being fully in the round. The depth of the cutting permits the overlapping of figures on two and even three planes. Each figure is individual and possessed of a life and movement of its own. The variety of poses is infinite. The reliefs reflect a sense of confidence among the artists, who appear to discover new possibilities for the depiction of the human form. There is a vitality and rhythm in the closely grouped compositions. In the early tradition of art, a sense of grace prevails upon all forms. The figures portray a quality of surrender to the harmony of existence. These are not heroic individuals struggling against the vicissitudes of life but beings who recognise their place as a part of the whole of existence. It is this view of life that provides the ease and the joyousness to the figures. The sumptuous richness of the carvings is a celebration of the divinity that is all around us. The Buddha preaching, Nagarjunakonda, 3rd or 4th century A.D. (ASI site museum, Nagarjunakonda). 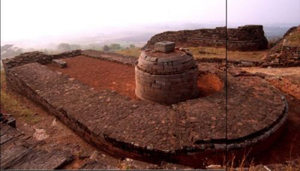 The sculptural remains at Nagarjunakonda have been securely dated to the 3rd and 4th century A.D. As in the case of other Buddhist monuments, the stupas were made under the rule of kings who worshipped Brahmanical deities, in this case the Ikshvakus. Since the Indus Valley civilisation, India has been well known for its flourishing trade. Great centres of art have come up at junctions on internal and external trade routes. Greeks, Parthians and others who stayed in India took to Indic beliefs and expressed their devotion to deities in numerous inscriptions. Commerce brought people from faraway parts of India and elsewhere together in a spirit of mutual understanding and appreciation. It is such a spirit of warmth and giving that is contained in donative inscriptions of this period across the whole of India. Here, in the Krishna Valley, too, donations of sculptures were made “for the benefit of all sentient beings of the world”. The exquisite phase of the Amaravati art was under the rule of the Satavahana rulers. They were devoted to Brahmanical deities and were fully benevolent to the Buddhist sangha. However, as in central and western India, this was an art of the people. The individual pillars and sculptures were the donations of lay people and the monastic community. Nuns, many of whom held high religious titles, outnumber monks in donative inscriptions. Everywhere in ancient Indian inscriptions, it is seen that women enjoyed a high economic and social status. 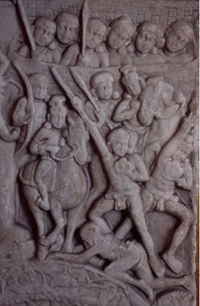 In the last period of the reliefs of Amaravati, a more taut and crowded grouping of figures can be seen. The limbs are elongated, in anticipation of the style to be found in the reliefs of nearby Nagarjunakonda. Worship of the Buddha, Amaravati (ASI site museum). The fluid forms of the body, carved out of limestone, in the reliefs of Amaravati are reminiscent of the early paintings of Ajanta. The graceful lines convey surrender to the greater order of the universe. It is an art that does not seek to convey photographic reality. Instead, the grace that underlies creation is the dominant theme of the compositions. Besides the Buddha figures in the reliefs, a number of freestanding Buddhas have been found at Amaravati and other sites of the Andhra region. They date from the 3rd century A.D. onwards. These are quite different from the Buddha figures that were being made at Mathura and Gandhara and show an independent artistic conception. These were to be the models for the Buddhas of Southeast Asia. While the glorious Mahastupa at Amaravati was made and sculpted in different stages, from the 1st century B.C. to the 3rd century A.D., many other stupas were made in the Krishna Valley. Their railings and drum slabs are part of a vast surviving corpus of the early art of Buddhism. In the 3rd century A.D., the power of the Satavahanas began to fade. However, the tradition of art, which had blossomed under them, continued. The Ikshvakus came to power in the second quarter of the 3rd century and established a new capital called Vijayapura, or the City of Victory, in the Nagarjunakonda Valley. The great Buddhist teacher Nagarjuna, one of the most important proponents of Mahayana philosophy, was known to have lived here in the 1st or 2nd century A.D. Nagarjunakonda means “the hill of Nagarjuna”. The area continued as an important centre for the development of Buddhist philosophy under the Ikshvakus. A large number of monastic establishments for residence, study and worship were founded here for at least four different sects of Buddhists. 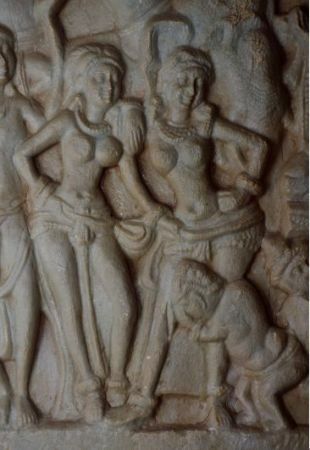 Women in casual stances, Nagarjunakonda, 3rd or 4th century A.D. (ASI site museum). There is an ease and freedom in the manner in which one leans upon the other, who is shown holding her girdle. This is a quality also seen in the early first millennium sculptures of the caves of western India, notably at Karle and Kondavane. Unlike Amaravati, the remains at Nagarjunakonda have been systematically excavated and securely dated through inscriptions to the 3rd and 4th centuries. The original site was submerged by a dam in recent years. However, the edifices were carefully reconstructed and have been preserved for the future. In Indic tradition, theology was never confined by dogma. Early literature is full of accounts of public intellectual discussions between teachers of different sects. This climate, in which different sects and philosophies coexisted, is seen in the remains at Nagarjunakonda. Chaitya-grihas with stupas are made next to shrines with statues of the Buddha. Worshippers of both share a common vihara, or monastic residence. The style of the sculpture here is very similar to that in the last phase at Amaravati. The figures are lively and full of movement. They are cut deep into the stone. The tradition of the depiction of the stupa is continued here, on the sculptural slabs of the monument. These are made along with Gandharvas, who bring offerings to the stupa. These celestial beings are a constant motif in Indic art from the 2nd century B.C. onwards. STUPA SLAB, NAGARJUNAKONDA, 3rd or 4th century A.D. (ASI site museum). There is a tradition of self-imaging in Indic monuments. This is a depiction of the profusely decorated stupa made on a slab, which was placed on the monument itself. Such depictions are invaluable as they give one an insight into how the stupa would have been decorated originally. The many finely made depictions here include the scene of the birth of the Buddha. Queen Maya, the mother of the Buddha, gave birth to him while standing under a sal tree. The artist depicts her in the continuing style of the shalabhanjika, who represents the flowering abundance of nature. Her name, Maya, means the illusory nature of the world of forms around us. It is there as a reminder to the devotee. 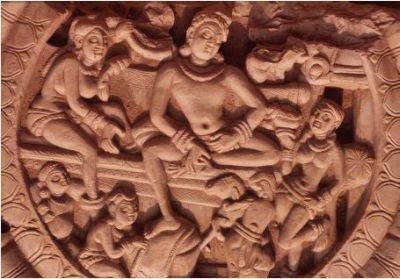 The Great Departure of Prince Siddhartha is depicted. Divine beings hold up the hooves of his horse, Kanthaka, so that he may ride out of the palace silently. The creative force of nature is expressed in Yakshis, whose mere touch causes trees to blossom. This continues as a theme from the earliest stupa railings of Bharhut. As in the case of all major Buddhist monuments since the 2nd century B.C., these at Nagarjunakonda were made under the rule of kings who themselves worshipped Brahmanical deities. However, in keeping with the Indic traditions of dharma, they were fully benevolent to institutions of all faiths. As was often the case, some female members of the royal family were devoted to Buddhism and made personal donations to monasteries. A number of Brahmanical temples were also made at Nagarjunakonda during the period. However, none has survived. The ultimate belief was in the oneness of the whole of creation. The sculptures were made, as donative inscriptions proclaim, for the benefit of “all sentient beings”. The artist continues to present before us the grace that underlies all that is around us. That grace is also deep within each of us, and we respond to it when it is presented before us in art. CAVE 1, GUNTUPALLI. The Buddhist heritage of the Krishna Valley spans more than a millennium. This fascinating cave is reminiscent of the earliest rock-cut caves in India, at Barabar in Bihar. The Guntupalli rock-cut caves date back to the 3rd to 2nd century B.C. and other structural remains at the site go up to the 5th to 6th century A.D. Earlier, art brought to us the vital and living world of nature, in which man was only one part of its existence. By now the focus had shifted. Some of the attention of the earlier art, to the joy and frolicsome world of natural creation, had been left behind. The emphasis had now come more on men and women.